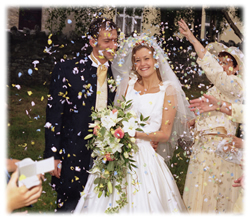 Please ask if you would like me to post you a sample wedding DVD to look at. I will send you a full wedding film, not a "showreel" (which only include the "best bits"). Below is a small selection of the many wedding and other films I have produced. 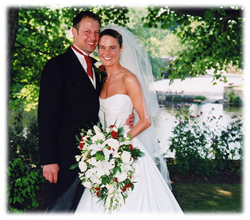 Short highlights of their wedding; a full length version sample DVD is available on request. Full length video of 2007 Christmas wedding. Church; Christ church (Dore near Sheffield). Wedding reception; The Maynard hotel, Grindleford (Peak district). Includes messages to the bride & groom (at end of video) and out-takes. Full length video of 2008 wedding. Church; St. John's, Oulton. 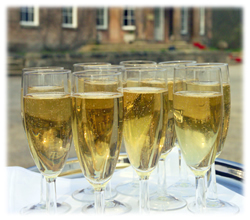 Wedding reception; Monk Fryston hall hotel. Includes messages to the bride (at 55mins) & groom and out-takes. Full length film of Radio Aire wedding competition winners Leanne & Paul's 2013 wedding at the Marriott hotel, Leeds. Includes video messages to the bride & groom (at 1 hour 2 mins). Fiona & Lee's 2011 wedding at the Yorkshire hotel, Harrogate. They also opted for a "marryoke" song video; see below. Fiona & Lee's choice for a marryoke (lipsync) video; I gotta feeling by the Black Eyed Peas (including some nods to the band's original video). Full length video; 2013. I was asked to film the wedding ceremony simply for the reading by their daughter, and to take photos through the whole day, so this is a combined footage film. I also film funerals, particularly for those unable to attend; in this case relatives live in Australia so the footage was uploaded to YouTube soon afterwards.